The ball off the bat of Westminster's Ryan Miller seemed to stay in the air forever. But when Lovett shortstop Trent Beavor shagged a routine pop fly, the Lions could officially celebrate. 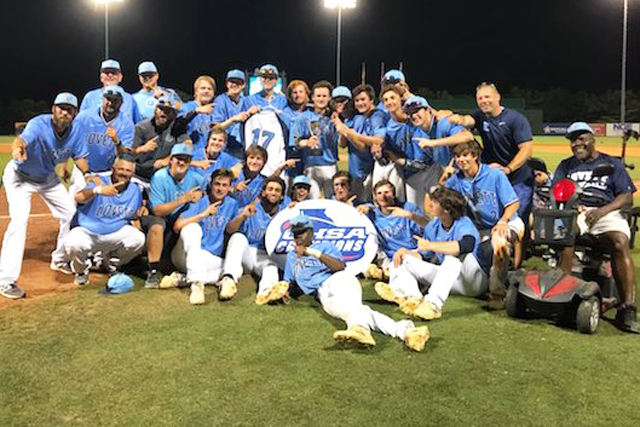 Lovett scratched home a pair of runs in the top of the sixth inning on RBI singles from Will Seiler and Peyton Ringer, then they turned it over to the bullpen, who disn't diappoint to help the Lions to a 2-0 victory in Game 3 of the Georgia High School Association Class 3A state championship series Thursday night at State Mutual Stadium in Rome. The two teams split the first two games of the doubleheader on Monday at Mercer University's OrthoGeorgia Park at Claude Smith Field in Macon. But rain washed out Wednesday's scheduled Game 3 and forced the two teams, located less than two miles apart, to play a winner-take-all contest in Rome. The Lions (28-11), who finished as the No. 2 seed in Region 5-3A play, captured their second state title in three years and their ninth in the program's history. Westminste, who won the region title, finished its season at 25-13. Lovett starter Dhruv Patel pitched 5 1/3 innings of scoreless baseball but got a no-decision. Patel allowed just six hits. David Underwood pitched a third of an inning and earned the victory, while Wyatt Nelson worked a scoreless seventh to earn the save. Westminster had its chances but left nine runners on base. Robert Poindexter went 3 for 4 to lead Lovett's offense.